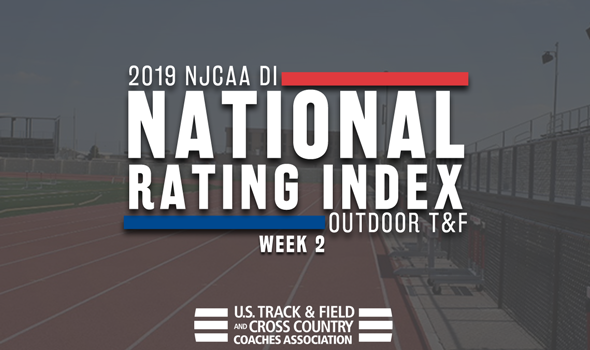 NEW ORLEANS – The season keeps on rolling, which means its time for the latest edition of the NJCAA Division I Outdoor Track & Field National Rating Index that was released by the U.S. Track & Field and Cross Country Coaches Association (USTFCCCA) on Wednesday. A new team captured the top spot on the men’s side, while a familiar face continued its own record streak atop the women’s chart. Just your friendly reminder that more and more changes are expected as we move closer to the 2019 NJCAA Division I Outdoor Track & Field Championships on May 16-18 in Hobbs, New Mexico. The next NJCAA DI National Track & Field Rating Index will be released on Wednesday, April 17. For the first time in program history Barton (Kan.) CC was selected as the top team in the nation. The Cougars are fresh off a weekend spent at the WT Classic & Multi in which they added numerous individual accomplishments to the newest TFRI. Included in that is Kevin Nedrick (the national-leader in the discus), Alencar Pereira (tops the country in the hammer), Dartez Hamlin (second in the 200), Phillipe Barnett (second in the discus and fourth in the hammer), Kenroy Williams (second in the 400H) and Kaleb Ambrose (third in the decathlon). The group’s 4×400 is also the top-ranked squad in the country while the 4×100 is fourth overall. Also setting a program best was Coffeyville (Kan. CC) after a one-spot improvement in the ratings. The Red Ravens added multiple individual performances to the newest TFRI with the best coming from James Brown (tops the nation in the long jump), Darius Clark (third in the same event) and Miles Marhofer (third in the hammer). The team’s 4×100 relay also now find themselves at fifth overall. Dropping two spots to No. 3 was South Plains (Texas) despite a strong weekend. The Texans were at the Angelo State David Noble Relays and saw top performances out of Moitalel Mpoke (now ranked first nationally in the 400H), Bryson Deberry (first in the high jump) and Riley Finnegan (third in the discus). Holding steady in the No. 4 spot was Iowa Central CC after a weekend at the Hilltopper Relays. The Tritons saw big weekends from Phemelo Matlhabe (now second nationally in the 400), Tyler Lineau (fourth in the discus and fifth in the hammer) and Courtney Lindsey (fourth in the 100). Also holding pat was Cloud County (Kan.) CC in the No. 5 position. The T-Birds were at the Friends University Spring Open were they were led by Saba Khvichava who is now the national-leader in the steeple. Making up the rest of the top-10 was Central Arizona, Western Texas, Hutchinson (Kan.) CC, Monroe (N.Y.), Mesa (Ariz.) CC. This week had mixed results in terms of movement as 16 of the top-25 teams moved around. The largest leap taken out of these teams was taken by Hutchinson with a 10-spot increase which also happened to be the biggest improvement out of any team in this week’s index. New Mexico JC earned the top spot in the nation for the second week in a row. It extends the program’s record for most consecutive weeks spend at No. 1 to five, dating back to last year. The Cougars added a plethora of times and marks to the index with the best coming from national leaders T’Nia Riley (100) and Fiona Richards (discus) to go with Riley in the 200 (fourth overall), Christal Mosley (third in the 400) and Nijah Roberson (fourth in the 400). The program’s 4×400 also posted the top mark in the country while the 4×100 is ranked second overall.